A 38 North exclusive with analysis by Joseph S. Bermudez and Jack Liu. 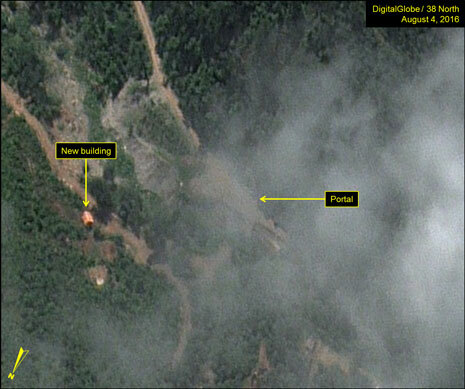 Recent commercial satellite imagery from August 27 shows new activity at the Punggye-ri nuclear test site. Notably, a small number of mining carts are visible on or near the tailings piles at both the North and West Portals; the tailings pile at the West Portal has expanded and new tracks for mining carts have been laid; and a small building has been erected to the southwest of the South Portal. 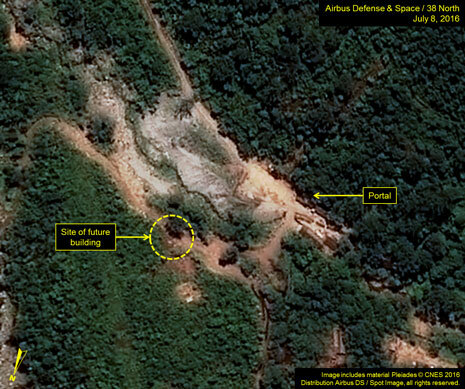 Overall, this activity indicates that maintenance and minor excavation operations have resumed at Punggye-ri. 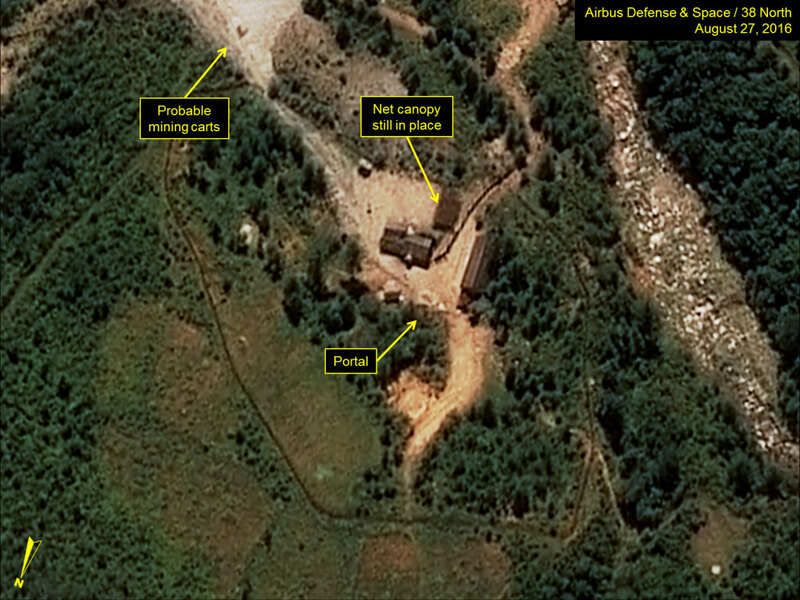 However, it is unclear if this activity is directly related to preparations for a fifth nuclear test. 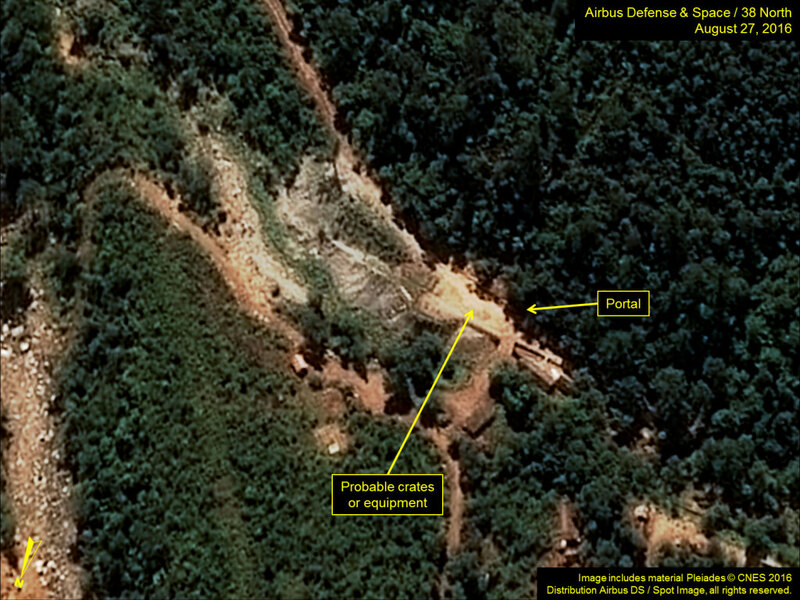 Commercial satellite imagery from August 27 showed the continued presence of a new 6-meter by 9-meter net canopy that was erected immediately south of the support building at the North Portal a few weeks earlier. This canopy is clearly intended to obscure the presence of equipment or activity. Additionally, there are a number of objects, likely mining carts, located on the tailings pile to the east of the portal. None of these were visible in imagery from July 7, while only a few were visible in imagery from August 4. The tailings pile itself, however, appears unchanged. Figure 1. 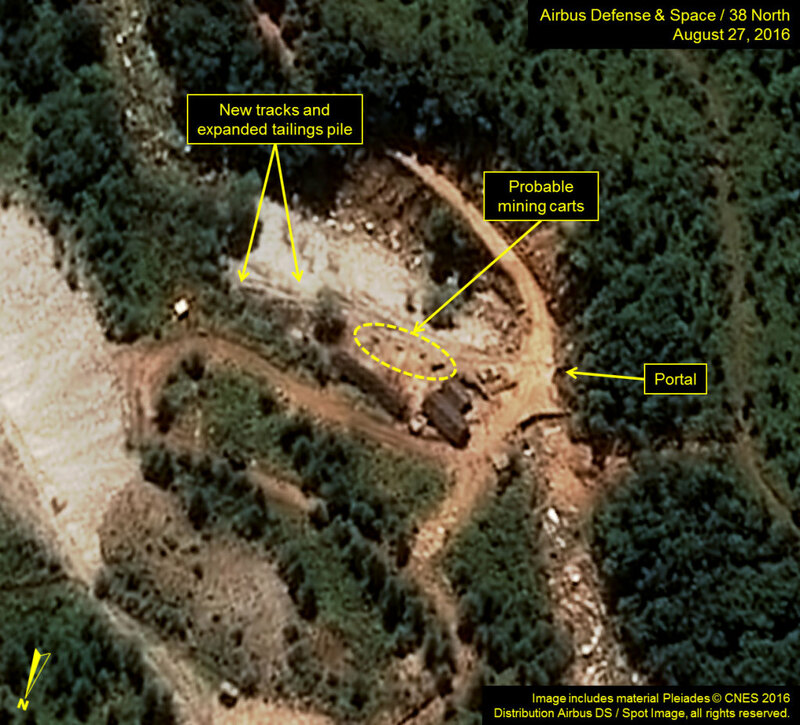 Canopy still in place and mining carts near the North Portal. At the West Portal, the northwest corner of the tailings pile has expanded somewhat during the past four weeks and new tracks for mining carts have been laid on its crest. Three to five mining carts are visible immediately south of the support building, indicating that minor excavation operations have resumed. Figure 2. The tailings pile at the West Portal has expanded and new mining cart tracks have been laid. No significant activity is noted at the Main Administrative Area as of August 27. 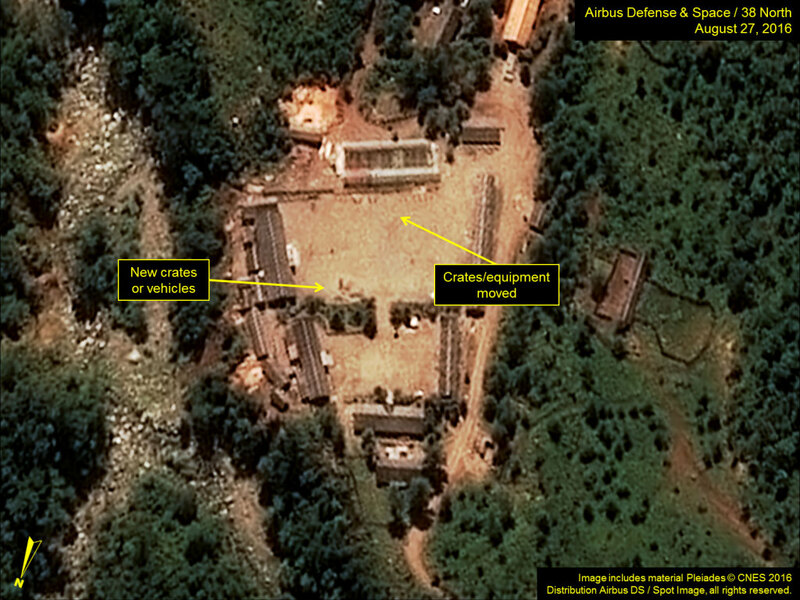 The supplies or crates that were stacked in front of the greenhouse in an August 4 image are no longer present, but what appear to be several new small crates are present at the north end of the main courtyard. Figure 3. Supplies or crates seen around the Main Support Area. At the entrance to the South Portal, there a number of small crates or pieces of equipment visible in the August 27 image. Additionally a new small building was erected, approximately 60 meters to northeast of the portal between July 8 and August 4. Figure 4. Crates or equipment seen near the South Portal. Figure 5. New building erected near the South Portal. There is no significant activity at the secured Command Center, although this facility and adjacent support area appear well-maintained.